Recently purchased a new PC (thanks 3XS) and migrated to Win 10. Sadly Edirol/Roland do not officially support Win 10 with some of their older USB devices (likely due to costly driver certification? 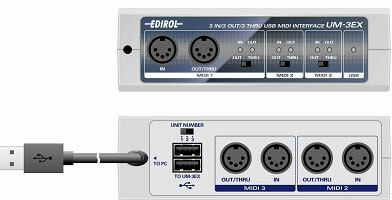 ), so was unable to install my previously trusty Edirol UM-3EX 3-in/out MIDI interface. It attempts to install them, gets halfway through, then suddenly states the drivers aren't compatible and automatically launches the uninstall process. Attempting to install with compatibility settings, admin privileges, etc. also fail to work. However there is a workaround that people have used with V-Drums and it worked for my UM-3EX too, although it takes a little editing and bypassing certification. It's worth a try before you junk or ebay the unit which I was about to do. • Remove the Edirol/Roland USB device from your PC, if connected. • Download the Windows 8.1 drivers for your Edirol/Roland device (UM-3EX in my case) from the Edirol/Roland website. • Extract the contents its own new folder (um3ex_w81d_v101, in this case). • Open these *.inf file(s) using Notepad. • The above lines of code show the drivers would be installed by Windows 8.x, but not for versions after it, even if they are compatible. To get it to install for Windows 10 you will need to copy the line of code that was used for [Roland.NTamd64.6.2] and paste it into the [Roland.NTamd64.7] section, overwriting where it says ";; not supported". • Save the *.inf files (overwrite them). Given the drivers have now effectively been 'tampered' with, Windows won't automatically allow them to be executed as a security precaution. Therefore you will need to install them without driver signature enforcement. • Click Windows Start, and type "Change advanced start-up options" and execute it. This will take you to the Windows 10 Settings Recovery options. • On the right, where it says Advanced Startup, choose "Restart Now"
• Once it takes you to the blue menu screen, click: "Troubleshoot", followed by "Advanced Settings" > "Startup Settings" > "Restart". • Once PC has restarted, press the number 7 to 'Disable driver signature enforcement'. • Finally, navigate to where you extracted and modified the drivers and install the new modified drivers. Follow any on-screen prompts and insert the Edirol/Roland USB device when requested to complete the installation. • Restart PC after completion (this will automatically take you out of 'disable driver signature' mode). Thank you for the clear and concise instructions, much appreciated! * disclaimer - where I say not i actually mean; it appears to works perfectly. Thanks for that. I've got a UA-25 which I've been using in class-compliant mode with my Surface but that has meant I can't use 24 bit or MIDI. I'll give this a whirl. I just picked up an Edirol M-80 but (stupidly) forgot to check the support page, Roland stopped supporting the keyboard after 8.1. The hack worked like a charm, if fact my Fantom X8 doesn't seem to like Win 10 64, I might give that a try too!! You are the best my friend! Ive been using my PCR 500 for years since Win7 and now thanks to you Im still using it with Win10. The hardware is still great and Ill keep using it till it dies. I used an almost identical method to get my 16 year old Roland XV5050 module to work with Win 10, so definitely worth a try with any older Roland USB hardware. For Edirol PC-50 it turned out to be easy (after a lot of hacking and cursing). Detach the USB cable, turn off the power, move the "Advanced Driver" switch to off, reconnect and turn on the power again. That's it! I have found this hack to work for my Edirol UM-1X, but find that after a Windows update the driver has been removed. I think this is now the third time. Is there any way to stop Windows removing unsigned drivers when an update occurs? I don't use my MIDI interface very often, but when I do I am usually out somewhere and just want it all to work when I plug it in. The hardware is still in good condition, and once the driver is properly set up it works like a charm. Why should I need to buy a new device, or go through this convoluted process over and over again? greenfox4075 wrote: I have found this hack to work for my Edirol UM-1X, but find that after a Windows update the driver has been removed. I think this is now the third time. Yep, I noticed it with the Anniversary Update, and Creators Updates. I think it's because such Windows updates are entire OS refreshes, rather than bolt-ons, and it afterwards attempts to redownload and install new drivers rather than re-use the ones that are previously installed. The Edirol device seemingly wont be recognised after such an OS update. The LED on my UM-3EX didn't even light up showing it was connected, regardless of which USB port I tried, looking for all the world like it was a dead device. After the OS update I removed the device, uninstalled the Edirol drivers (they were still seemingly installed), restarted the PC, then followed the same instructions on this page again to reinstall the device, and everything's lit up and working again. Luckily the methodology hasn't changed with each update at all. I've saved my own modified drivers to a compressed file (WinZip) to save downloading and editing them from the internet each time, though. Cuts one headache out at least. Hi, thought I would flag this one up again, as the latest Windows 10 update caused the (previously hacked ‘W10’) Roland drivers to stop working again on my UM-880/UM-550. By stop working I mean that the USB LED indicators on the 880/550 went out and no data transfer USB>MIDI with Edirol Original Driver setting. They would work in generic USB driver mode, but I read (above/elsewhere) that updates might stop previously working unsigned drivers, and it would be necessary to reinstall. Followed the advice above again, but would add, you might as well uninstall the ‘old’ drivers first (uninstall EXE is in the driver folders), as the driver installation insists on uninstalling followed directly by reboot, so after a reboot it isn’t in the special mode and won’t install unsigned drivers anyway, might as well get it out of the way first. I have an Edirol FA 66 that I recently dusted off. Since I have upgraded my computer from an ancient MAC to a spanky Win 10 since I last used the FA 66, I searched the net for cable connectivity solutions as my new computer has a thunderbolt port, no Firewire. I read that it is possible to go from FW400 to TB2, TB2 to TB3 with the right adapters so have forked out on those. Then read the OP of this thread, with the advanced startup procedure. I am not super savvy about all this, and may be missing something, but I have tried and tried to get it to install about 67,897,00 times with no success. Is it possible to install this FA 66 with Thunderbolt? I would assume that if it works with Tb, it should install with Tb as well? Many thanks for any help or advice! Hi All, Thanks so much for your suggestions, My Edirol PCR-500 is working now on Windows 10 Pro 64 bit! I'd like to add that uninstalling the existing driver didn't work for me. What did work was explicitly updating the driver by pointing to the (64 bit in my case) folder containing the driver with modified .INF files. In all other attempts Windows kept using an earlier installed version. Good Luck with solving this or similar problem(s) on your machine. Over the weekend I upgraded my Win 8.1 to Win 10 and had real problems with my V-Studio device. I have just now updated the driver for Win 8.1 for Roland V-Studio 20 following your exceptionally clear instructions. It worked like a charm and I want to say a huge thank-you for supplying such clear directions. I was about to reverse the Win 10 install as I did not want to have the device inoperable. It is a great piece of kit and Win 10 benefits were not such that it overcame the need to buy a new guitar digital interface. Again, many, many thanks and Happy New Year 2019 from Canada.